While most people have sound reasons to rent art, what they don’t know are the tricks of the trade and the risk areas which some art galleries won’t tell you. Don’t get tied into a 12 month fixed term rental contract. A one month term, extendable on request should be adequate. If the rental term being offered is 12 months, request a lesser term or push for a rental discount. Request a copy of the Consumer Credit Sale Agreement and Disclosure Statement (which is legally required). If they don’t have one or supply one, they are being careless. The agreement will also touch on matters such as ‘your right to cancel, time limits for cancellation and any charges you might have to pay in the event you cancel’. Ask if they are going to register a financing statement on the Personal Property Securities Register while you pay the artwork off. This is a ‘retention of title’ clause. Ask if any form of rental rebate is available in the event you decide to purchase. Renting art offers one significant benefit and that is the option to refresh your artwork regularly. Take advantage of a refresh, at least once every six months. If they don’t allow you to refresh more regularly, go elsewhere. Think about the amount of time it would take you to pay the painting off. For instance, if the painting is worth $3,000 and you are paying $130 per month in rental, it will take you less than two years to pay the equivalent amount in rental. In this case, it might be more prudent to buy it if you really love it. The message here is that the less expensive the painting, the more you should consider the option to buy. Choose an art gallery that offers the option to rent art OR buy the artwork. That allows you to rent first if you wish and then decide whether you love the artwork enough to purchase it. Select an gallery that offers at the very least a free consultation service. 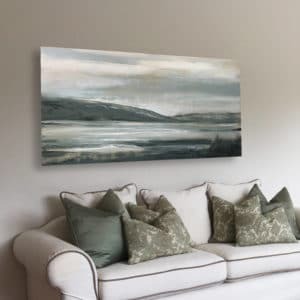 Some galleries offer a free consultation and in addition will photo-shop multiple artworks onto your wall space so that you can visualise a variety of pieces in situ. Ask if all their ‘stocked artwork’ is available to view online. Some galleries don’t keep their website up to date. Others display artwork that they simply don’t have immediate access to. Sometimes they display artist’s works that they no longer represent. Look at the art gallery website and see if they offer any additional functionality or services. See if there is a Web App or Smart Phone App available which allows you to superimpose artwork onto your own wall space. Most important is that the ‘rent art’ option allows the customer to feel comfortable about buying a statement piece for their home or office – it becomes a ‘try before you buy’ option. Couples and office staff rent art to experiment with their varying tastes so they can ultimately agree on what they may purchase. Renting provides access to an often broader range of artwork. A rental company can often stock up to a 1,000 pieces of art from which you can choose. Dealer galleries don’t rent art and therefore focus on running exhibitions for a limited number of artists at any one time. Often only one artist. Your immediate selection is therefore limited from a dealer gallery. Couples selling their residential home elect to home stage their house using art. A ‘Rental Art Gallery’ offers a larger variety of artwork at a relatively cheaper cost. In summary, for those wanting to build an art collection, renting artwork initially offers you an opportunity to build confidence in your final decision to purchase the right piece. For others, the renting option allows you to choose a variety of pieces and swap them out regularly at relatively little cost.